Few things can be as unpleasent for children as coughs and sore throats. these products are all naturally produced, gentle yet effective. Echinaforce® helps the body fight the symptoms of these infections by supporting the immune system, helping to maintain the body's resistance. 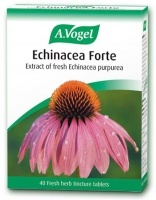 A.Vogel Plantago is a health supplement tincture that may be helpful for symptoms of congestion, catarrh, ear infections. A. Vogel Po-Ho Oil & A.Vogel Po-Ho Inhaler - essential oils of peppermint, eucalyptus, juniper, caraway & fennel.